Introduced last year, the revamped Cartier Santos has been a success, combining a signature design with practical features and a relatively affordable price tag. But the variants introduced so far are relatively ordinary, at least for the more experienced eye. Changing all of that is the new Santos de Cartier Skeleton ADLC “Noctambule” has just been unveiled at SIHH 2019. 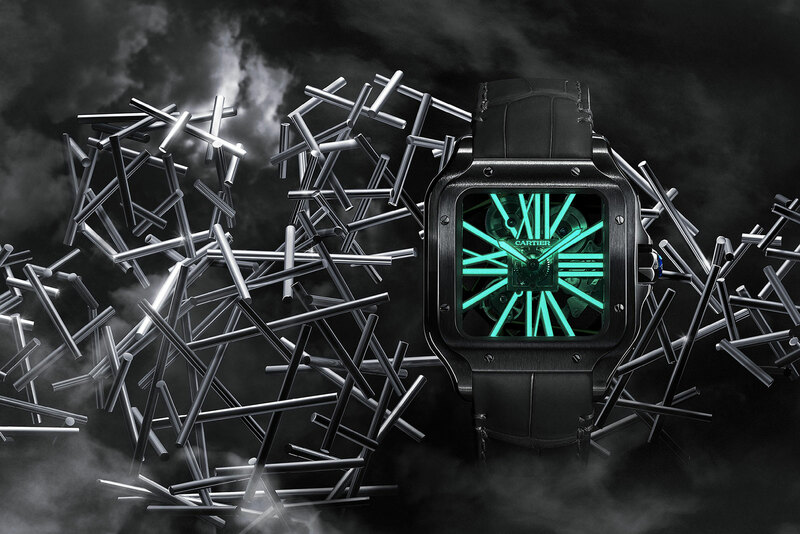 Noctambule translates as “night owl”, so the watch naturally glows in the dark. 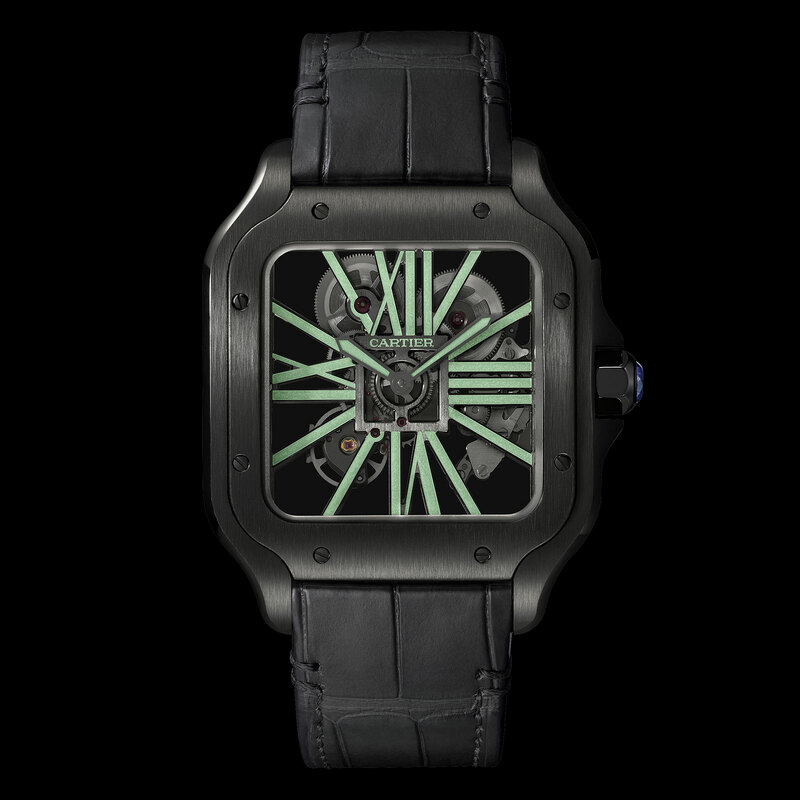 But because it has no dial, with the base plate of the movement having been skeletonised to form Roman numerals, the plate is painted with Super-Luminova, a photoluminescence substance that glows green in the dark. The idea is actually an old one, having been tested on the Tank Louis Cartier Noctambule of 2006. But that watch only made it to prototype stage (around three were made). The Santos “Noctambule” has a stainless steel case that’s coated with amorphous diamond-like carbon (ADLC), giving it a slightly glossy black finish, although the metal below has a brushed surface. It measures 39.8mm in diameter and stands 9.08mm high, exactly the same as the standard steel version of the watch. Inside is the cal. 9612 MC movement, which is hand-wound and has double barrels for a 72-hour power reserve. Like the other Santos watches, the “Noctambule” has the “QuickSwitch” strap removal mechanism that relies on a button on the back of the lugs to release the strap for easy swapping. But unlike the other models it is delivered with two crocodile straps, in black and grey, instead of a metal bracelet. 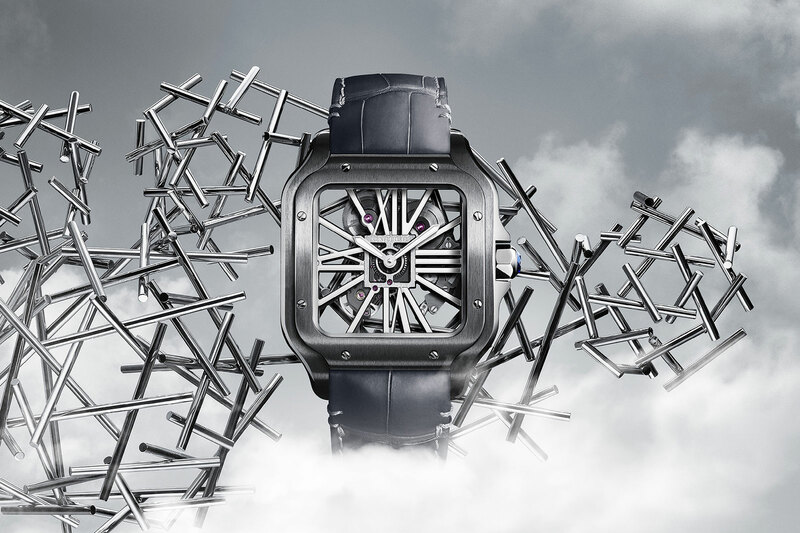 The Santos de Cartier Skeleton ADLC “Noctambule” (ref. WHSA0009) will be available from the second half of 2019 onwards. It’ll cost SFr26,500, or S$36,900. Tank Chinoise, Baignoire Allongee and Diagonale.